Indian literature is ripe with references to the Monsoon. It seems that every author who experiences the long months of drought followed by the gush of rain that falls in bucket loads for two months sees some allegory to life and its predicaments. Some see it as a kind of baptism, the cleansing of the sins of the world. Others see it more cynically, connecting the monsoon to man’s penchant to desire what we do not have, only to be drowned upon its realization. A few see it as a reminder of the circle of life, as well of the circle that mankind travels in Buddhist philosophy on the way to Nirvana, a climate karma. The religious see their God or Gods crying, or peeing, or offering up retribution for sins or salvation from suffering. I see it as annoying. I needed the metaphor of the monsoon. I came to India in no small part because I needed a change. A radical readjustment. To “wash away” something, not sins per say, but the obstacles and petty fights I had with the universe. Wash away the stress of never having enough money, of a house we loved and hated, of commute and weight and work and worry of life unlived. The monsoon, and India, changed little of this. We still stress about money, though in a different way, as we seem to make enough, but everyone else wants a cut. We are still tired, still deal with hurdles of life, it is just that the obstacles are different. Obstacles like, you know, the damn monsoon. Like so much of India, the monsoon is both a blessing and a horror. Difficulties persist, but I am reminded afresh that there is little we can’t handle eventually. I craved change, and got it, and shockingly little changed. The circle of life continues, though I pine for my circle of friends back home. 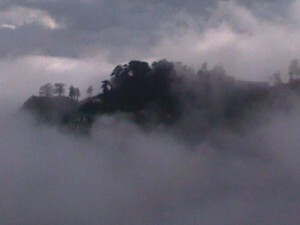 The rain is terrible, but the mist and the clouds that hover beneath the porch of our mountainside are breathtaking. The monsoon came, and I was not changed. And that was a bit of a revelation. Will, something I learned from my Mother long, long ago, is that you can go anywhere in the world, doesn’t matter where or how far but, you will carry your problems with you. Even if it turns out to be a different set of problems. Just learn to adapt wherever you are, make it temporary and enjoy the scenery. I feel like that’s what y’all are doing. And, it helps to see the rest of the world’s perspective on the same problems or how different their problems are compared to your. These are learning years for you and your family. I am proud you have the inner fortitude to actually remove yourself and your family to another world and way of doing things, so you can learn this. We can read and live vicariously through you and learn some things for ourselves, too. Problems may change their complexion through the eyes of your new surroundings. Keep writing and learning. We love reading and learning a little, too! I was born during the Monsoon, and my parents thought it was creative to name me after it. While I was reading your article I felt like you were talking about me everytime you referred to the rain, monsoon, itself. I found myself defending the storm as I read along, so I kind of read this from the storms perspective. I then realized that monsoon is a constant mild state of chaos that destroys and creates simultaneously. It’s a storm, and like any other storm, it too passes soon. And once it passes, you are relived that the storm is over and grateful for your life to go back to as it was. Maybe your trip to India and your experience of monsoon was the same. It made you miss your friends and realize that even though you were 7 oceans away from your problems and work, you would rather be back there with your friends and back to how things were. So when you got back home, you were glad that you were back and away from the “annoying monsoon”. And that’s one of the metaphorically purpose of monsoon. To make you miss what otherwise would be a life you were taking for granted.